Fayard and Harold Nicholas, whose careers spanned over six decades, made up one of the most beloved dance teams in the history of dance, The Nicholas Brothers. They were best known for their unforgettable appearances in more than 30 Hollywood musicals in the 1930s and 1940s including Down Argentine Way (1940), Sun Valley Serenade (1941) and Stormy Weather (1943). Their artistry, choreographic brilliance, and unique style — a smooth mix of tap, jazz, ballet and acrobatic moves — entertained and astonished vaudeville, theatre, film and television audiences all over the world. Their natural talents were honed early on. Their parents were musicians and led the orchestra at the Standard Theatre in Philadelphia. In 1932, the same year they made their first short film Pie, Pie Blackbird, with Eubie Blake, Fayard and Harold opened at the Cotton Club, at the ages of 18 and 11 respectively, working with Cab Calloway, Duke Ellington and Ethel Waters. Samuel Goldwyn saw them at the fashionable club and invited them to California to do their first movie, Kid Millions (1934). In 1940 they were contracted to 20th Century- Fox where they made six films. The Brothers toured Europe with Bob Hope, Eve Arden, Fanny Brice and Josephine Baker. They also starred in Lew Leslie’s Blackbirds of 1936. 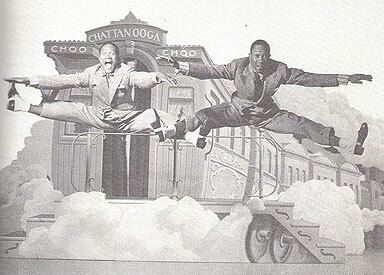 Fayard and Harold continued to perform in various Broadway, Off Broadway, and theatre productions throughout the United States and Europe until the 1980s. In 1981 the Brothers were honored with a retrospective of their work in films on the Academy Awards television special. Fayard received a Tony Award for his choreography in the Broadway show Black and Blue in 1989. Harold has received the Dea Award (Dance Educators of America), Bay Area Critics Circle Award for Best Principal Performance in Stompin’ at the Savoy, and the Harbor Performing Arts Center Lifetime Achievement Award. Other awards and honors include Black Film makers Hall of Fame (1978), Ellie Award (1984), National Film Society, Apollo theaters Hall of Fame (1986), First Class Inductees, Ebony Lifetime Achievement Award (1987), Kennedy Center Honors (1991), The National Black Media Coalition Lifetime Achievement Award (1992), Flo-Bert Award (1992), New York’s Tap Dance Committee, Gypsy Award (1994), Professional Dancer’s Society, Dance Magazine Award of 1995 (1995). In 1994 the Brothers received their long overdue star on Hollywood’s Walk of Fame. According to Who’s Who in Hollywood, The Nicholas Brothers were “…certainly the greatest dance team ever to work in the movies.” Harold died in 2000 and Fayard passed in 2006.